The Michigan basketball team will be without Derrick Walton for the foreseeable future, and the offensive ramifications of being without a skilled veteran have been widely discussed. 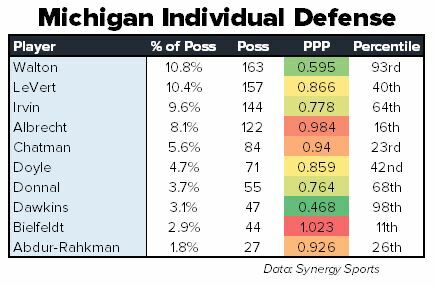 However, the sophomore guard was one of the Wolverines’ best defenders, and, according to John Beilein, one of their best resources on that end of the court. “I love the way he’s playing [defensively],” Beilein said of Walton in early January. Walton grades out as Michigan’s best overall defender according to Synergy Sports, allowing just .595 points per possession. Against Michigan State on Sunday, though, the Walton-less Wolverines had no answer for Denzel Valentine, who finished with 25 points on 9-of-16 shooting. The Spartan guard’s biggest buckets came in clutch situations and included a layup to begin overtime and the dagger with a minute left in the extra period. Michigan’s various zone defenses have helped, but the Wolverines still need to improve on the defensive end. Beilein said several players have the potential to become a shutdown defender, but “they have to learn a lot about moving their feet” and getting better leverage on attackers. With 10:31 remaining in the first half of Sunday’s game, Muhammad-Ali Abdur-Rahkman picked up his second foul of the afternoon while fighting for a rebound. The Wolverines were up 15-8 at that point, thanks largely to the freshman’s seven points and a pinpoint assist. Following his customary policy, though, Beilein benched Abdur-Rahkman, and the guard didn’t return to the court until the second half. Aubrey Dawkins and Spike Albrecht also committed two fouls each in the opening frame with similar results, and, at halftime, Michigan State held a five-point lead. Tuesday, Beilein defended his decision to bench players with two fouls in the first half, and the coach made no indication that he’s planning to change that tactic. Five-star wing Jaylen Brown had to postpone his planned official to Michigan in late January, but the highly touted class of 2015 prospect still plans to visit Ann Arbor this winter. Jaylen Brown has taken official visits to North Carolina, Kansas, Kentucky and UCLA. His fifth and final visit will be to Michigan.